Prague-based Studio Muon have completed a hair salon in Brno, Czech Republic, that looks like a cross between a warehouse and a dungeon (+ slideshow). Although it looks more a warehouse, the 1920s building was first constructed for use as a bank. Studio Muon converted part of the structure into a fashion showroom in 2008 and was brought back to add the hair salon in 2012. 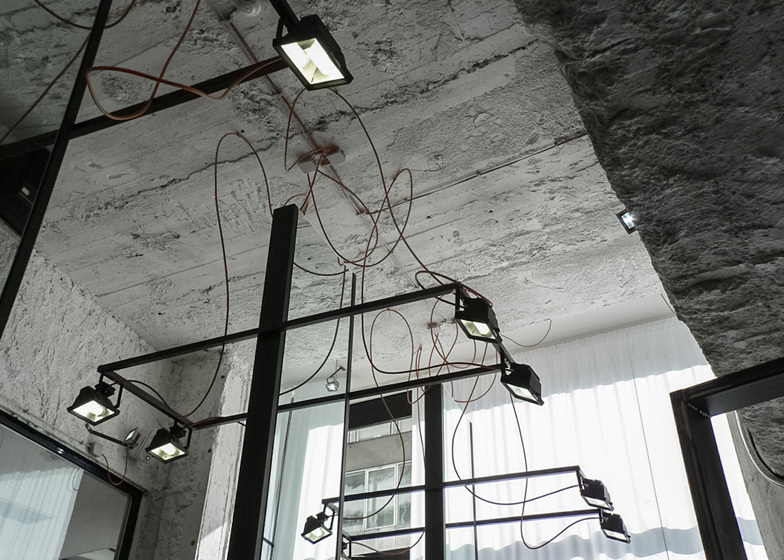 While the first space was designed as a simple room with garments hanging from the ceiling, the second is planned as a series of zones with styling stations propped up on a stage. "Different functions requested different spaces," architect Jiří Zhoř told Dezeen. "The main exhibit in the showroom is dresses, but in the hair studio it's people." 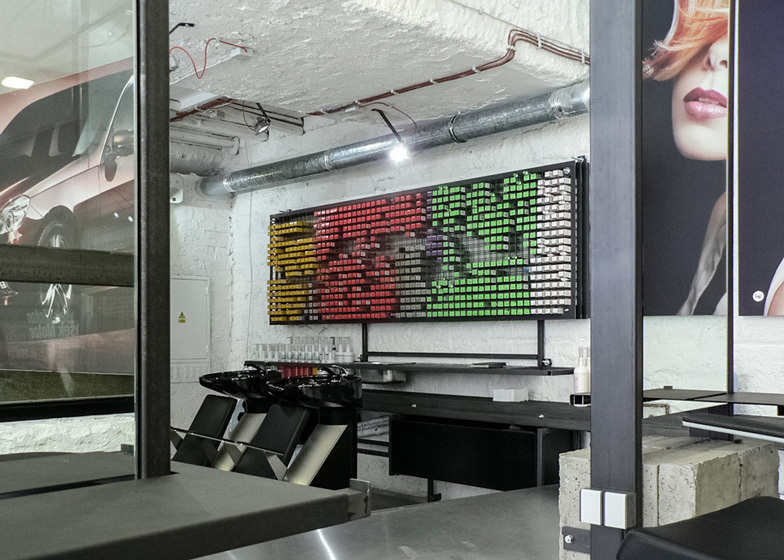 Mirrors bolted to rough concrete blocks run along the centre of the hairdressing platform, with chairs either side and spotlights suspended from above. 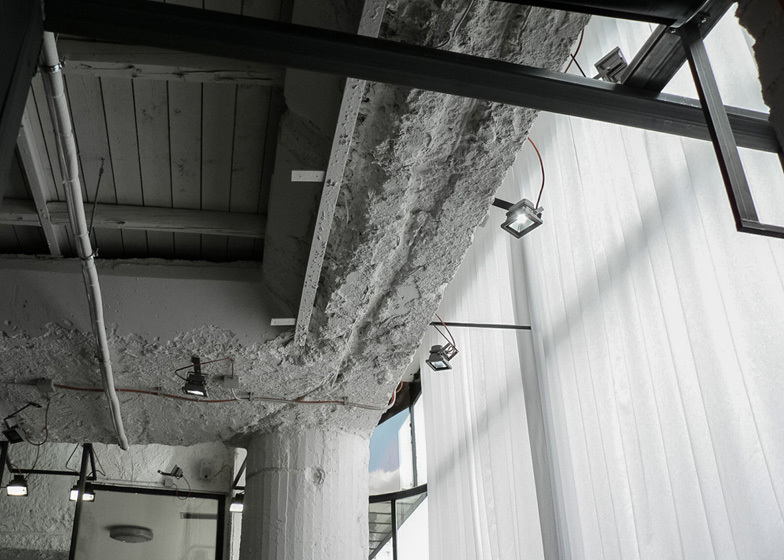 Concrete beams are used to front a steel reception desk. Elsewhere, reclaimed wooden joists are used as tables and shelf surfaces. 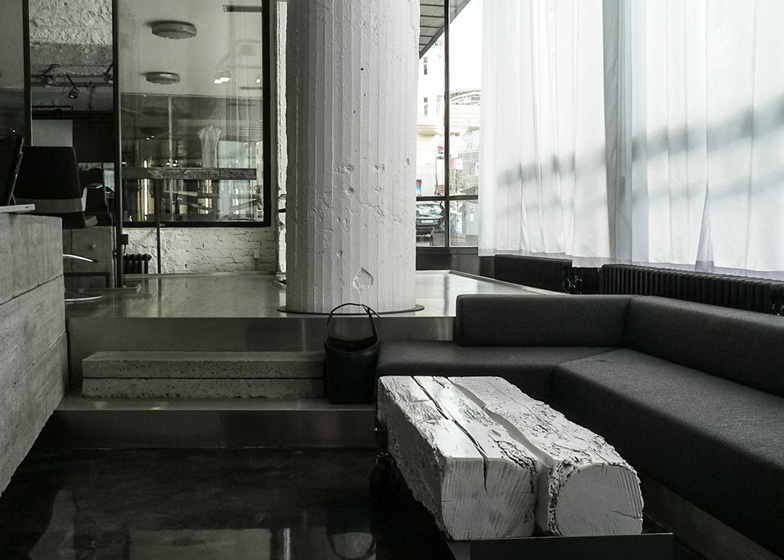 Other salons completed recently include a forest-like beauty salon filled with birch trees and a hair salon with copper pipes snaking across the walls. See more salon and spa interiors. Hair Studio "Tana Kmenta" is located in the bank building originally created and built in 1929-30 by Bohuslav Fuchs and Ernest Wiesner. It is located next to showroom DNB which is created by the same architect Jiří Zhoř in 2008. Both projects are symbiotically related, but different. The main consideration was to divide the zones and create an elevated podium/stage (level patio) which can be visible from the outside. To create a space where hairstylists can be seen carrying out their creations, the active section and the place to perform. Elevated podium is intersected by large mirrors which are supported with concrete blocks and basic lighting. The concrete blocks in a contrast with smooth stainless surface of the floor and mirrors further enhance elevated look. 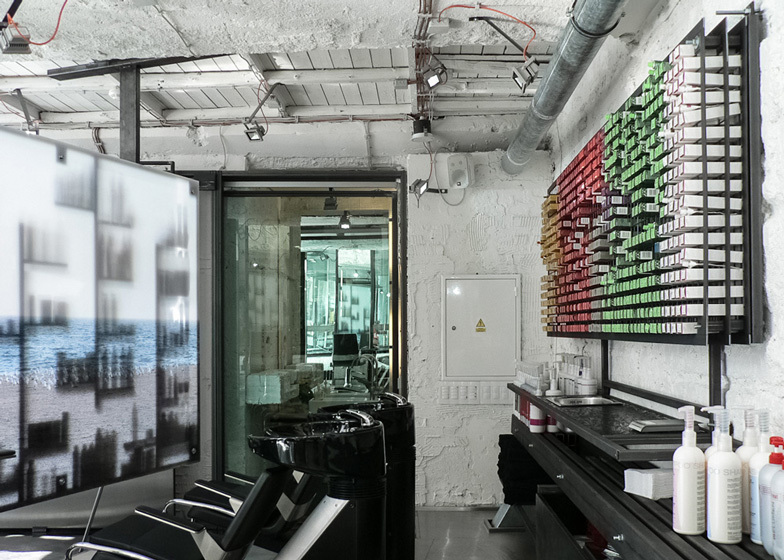 While the zone for cutting hair is visible from the street, the space with the reception and for washing hair have cosy atmosphere. The concept of furnishing is a solitary. All furniture and equipment are custom made. The principal materials are black steel, concrete block panels, old wood beams and glass mirrors. The moving table is made out of 200 years old wood beams. 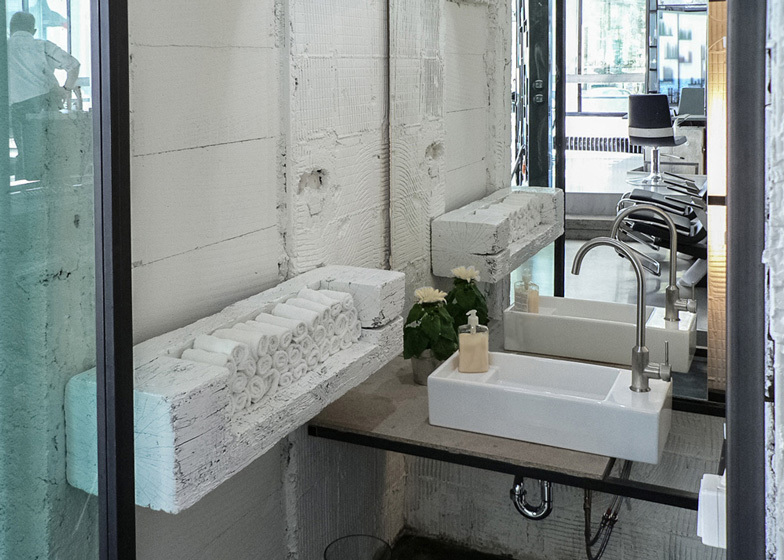 The reception is made from steel construction with concrete blocks same as weights under the mirrors. The important element is a functional basin with different shelves for hair chemicals. Minimalistic black reflectors evoke a feeling of theatre atmosphere. The building of the bank is unique thanks to its construction from reinforced concrete what was innovative in the time of its development in 1930. One of the aspirations of the project was to show off the basis of the building and its constructional principles. The atmosphere of the interior was soften by light white spraying what also created calmness and helped new elements to stand out in their real proportions and materials.